With a historic steam train, art galleries, Four Mile Beach and Mossman Gorge, there’s plenty to see here before you set off to visit two of Queensland’s biggest icons. 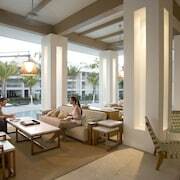 Make Port Douglas your first port of call with one of our Port Douglas hotels. 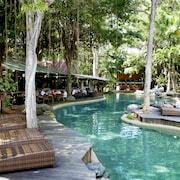 A one-hour drive from Cairns, Port Douglas was founded in 1877 after the discovery of gold at Hodgkinson River. By the early 1880s it was in a boom period, but in 1911 a cyclone devastated the town. When the 1960s came, Port Douglas was a tiny fishing village with a population of 100. But in the 1970s, tourists began to discover its quiet charms. 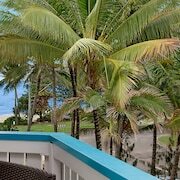 Stay in one of our Port Douglas hotels and you can walk to Four Mile Beach! Port Douglas’s main attraction, this four km stretch of sand and sea curves gently as far as the eye can see. You’ll spot rocky headlands in the distance and maybe even yachts setting sail in the sunshine. There’s a stinger net in place during stinger season so you can enjoy the refreshing water without being bothered by those pesky little creatures. Take a ride on the Bally Hooley steam train, a historic coal-powered locomotive that takes you from the Marina Mirage to several locations in Port Douglas, through areas of mangrove and rainforest. Pay a visit to one of Port Douglas’s art galleries, like Studio 49, Ngarru Indigenous Fine Art Gallery and Hoglund Art Glass Studio and Gallery. You’ll find local art and handmade jewellery too. Mossman Gorge, 20 minutes’ drive from Port Douglas, is part of the Daintree National Park and home to the Kuku Yalangi people. Here you can take a “Dreamtime walk” through the rainforest and picnic at one of the many swimming holes as you watch the river roll over granite boulders. 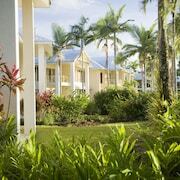 And while you’re here, you’ll naturally want to spend time at the Great Barrier Reef and in the Daintree Rainforest. Take a scuba dive, snorkel or boat tour of the Reef to see all that beautiful coral and marine life for yourself. Explore the Daintree for tranquil rainforest hikes, mountains, streams and beaches. 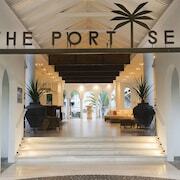 Do your shopping by the sea at the iconic Port Douglas Sunday Market. This market is a little bit different, because the stallholders are only permitted to sell items they’ve cooked or made themselves. Purchase some boutique art, jewellery or fresh food. You can find more shopping at Port Village, a pleasant open-air shopping centre. Port Douglas’s dining scene is a mix of award-winning seafood restaurants, beach cafes, bar and grills and heaps of other tasty choices. 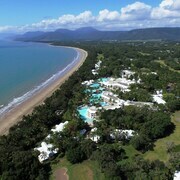 To get here, bundle up your flights to Cairns and Port Douglas hotels in the one package. 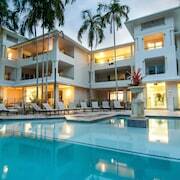 You can hire a car in Cairns or catch a shuttle bus from Cairns Airport to Port Douglas. 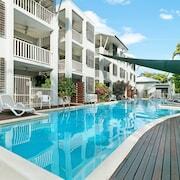 Stay in our Port Douglas accommodation and you’ll be close to Cairns, the Reef AND the Daintree. What could be better than seeing three of Far North Queensland’s most famous places in one holiday? enjoyed everything, the only thing i can say disappointing was that the swim up bar/pool was down and was down the whole week we were there. Good location, helpful staff. I hope to return one day when the renovations are completed. Pool could be a little bigger considering the size of the hotel. Ok but no lift to the room we had, and we didn’t know. Great hotel pool and tennis court is a bonus. Very spacious apartments. Location in quiet area.